Holidays, a time to rest, relax, recover and prepare for the next 12 months; back to school preparations for most are in full swing. Heading to school, for the first time or returning to school, meeting new classmates and teachers can be a really exciting time for your children. As parents the excitement is variable, mixed emotions of sending your youngest to school/ high school, watching them grow and develop and seeing their knowledge bases increase exponentially. Enjoy it, and even more so enjoy it without undue injury or pain. 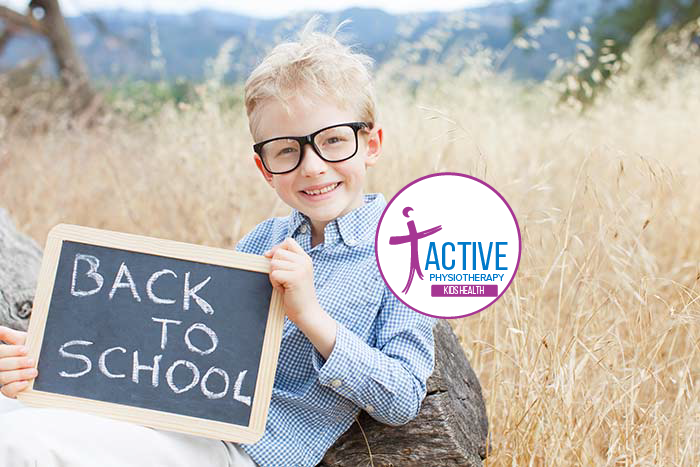 Here we have listed a few tips on backpacks, school shoes and keeping children active. Avoid the temptation of getting a backpack to grow into: a backpack should fit firm and snug on the back, and have wide straps that can be tightened so it does not hang past the buttocks. Ensure both shoulder straps are used, not the coolest look for the teens, but having a sore back is far less comfortable and prevents participation in sports and social activities. Pack the heaviest items closes to your child's back: the load will be easier to manage. Only pack what needs to be packed: use folders where possible and school lockers are a great idea: offload what you don't need all day and keep the backpack as light as possible. Keep children physically active: such as walking to school. Physical activity and strength are important and a strong core can protect the back. Limit use of electronic media (video games, iPads, computers and Television) to no more than 2 hours per day. If sitting for long periods is required: have a movement break. Even if it is just to go for a quick walk, or kick a soccer ball outside. Children should spend at least 60 minutes per day (throughout the day) of moderate to vigorous activity. In addition muscle and bone strength should be addressed 3 times per week. This doesn't mean weight lifting but can simple be weight bearing exercises and exercises using the body weight: crab races, squatting, jumping and skipping, pushing up off the floor. At this age engaging in sporting activities is enough for strengthening and coordination and can help with not only physical health but also social and emotional health. The heel of the shoe should be firm and not collapse inwards on itself. If the shoe can be folded on itself: it is usually a sign the shoe won’t be firm enough. Adequate cushioning for shock absorption is necessary to protect the joints: choose a firm and slightly raised sole with the main flex point at the ball of the foot. Select the right width: feet are so variable and so are shoes, so ensure length and width are addressed when getting your child fitted for shoes. Small arch support may be a key feature: particularly if flat feet are an issue for your child: inserts or orthotics may also help with this: if you are concerned about flat feet book an assessment with one of our physiotherapists, or head to our ask a physio section on the website. Therapist picks: Ascent range of school shoes, or the scholl orthaheel range of shoes. We hope all of the advice above helps you and your children have a healthy safe and injury free year. We are here for you at Active Physiotherapy.